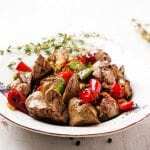 Mix together livers, butter, salt and pepper in a small oven proof bowl and bake for 20 minutes or until slightly browned. Sauté onion and garlic together, slowly in the butter until soft. Mix the paprika, chilli powder, stock powder, tomato paste, bay leaf, and wine together and allow to simmer for 3 minutes. Mix together the cream, cake flour, and water, and add to the paprika mixture. Allow to simmer until the sauce thickens. Add the chicken livers and simmer for a further 8-10 minutes.